A healthy diet supplies enough calories to meet your energy needs, plus all the protein, essential fats, vitamins, minerals, phytochemicals and fiber you need to stay healthy and help to prevent diseases. To get everything your body needs from the food you eat, without taking in too many calories, MOST of your food should be full of nutrients. This can be hard when you are bombarded with "junk" foods that are loaded with calories and have very little other nutritional value. This is not another diet book – it's an explanation and listing of all the nutrient-rich foods available in your supermarket and restaurants. Use it to help you make good food choices. 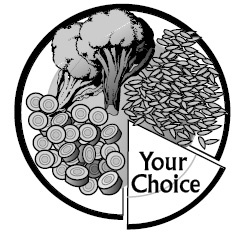 A reasonable goal for anyone who wants a healthy diet is to try to fill 80% of your plate with foods from the Food Lists: mostly fruits, vegetables, whole grains, beans and other seeds; what you do with the remaining 20% is entirely up to you. Almost everyone can use these Food Lists and follow the 80%-20% goal. See the section on Special Situations for extra helpful tips if you are diabetic, need to lower cholesterol or blood pressure, or want to lose weight. You'll also find tips for seniors, children, active teens and athletes; and people who eat in restaurants often or are just too busy.